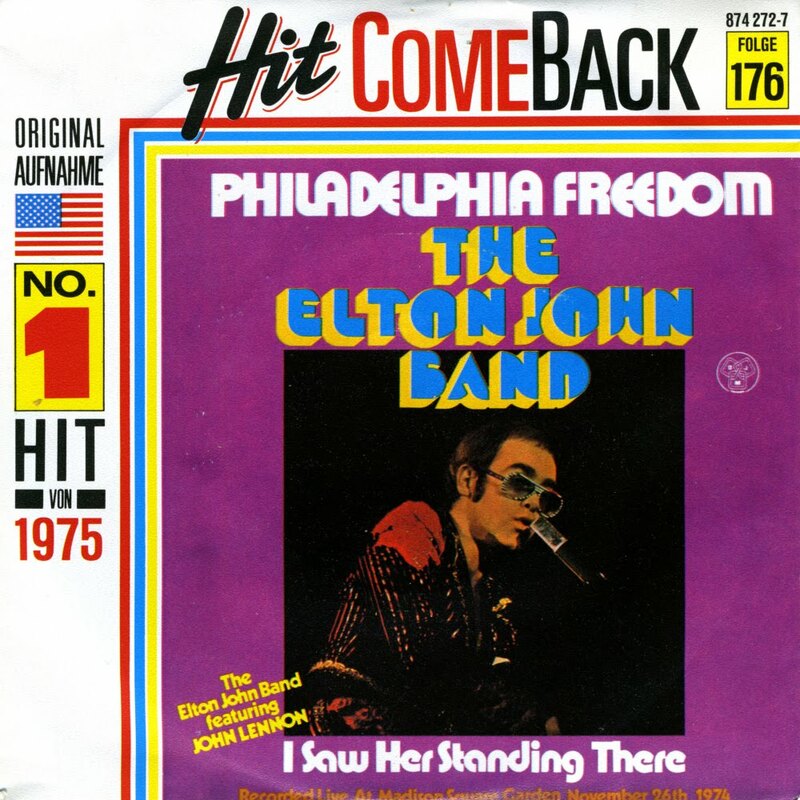 Elton John released 'Philadelphia freedom' as a single in 1975. 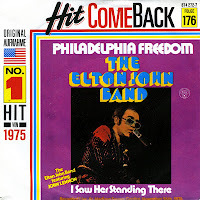 Elton, looking to honour his friend, tennis professional Billie Jean King, asked Taupin to write a song called 'Philadelphia Freedom', an homage to her tennis team. Taupin said, 'I can't write a song about tennis', and did not. Taupin maintains that the lyrics bear no relation to tennis, Philly Soul or even flag-waving patriotism. In the U.S. it was a charttopper in April 1975. 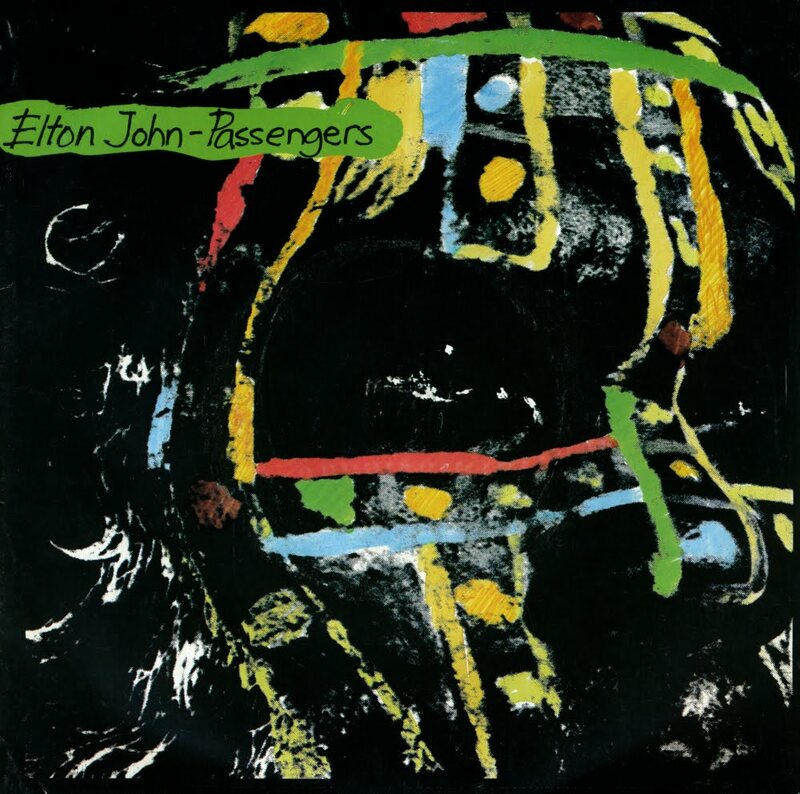 The B-side features a live performance of 'I saw her standing there' by Elton John and John Lennon at Madison Square Gardens on November 26, 1974. 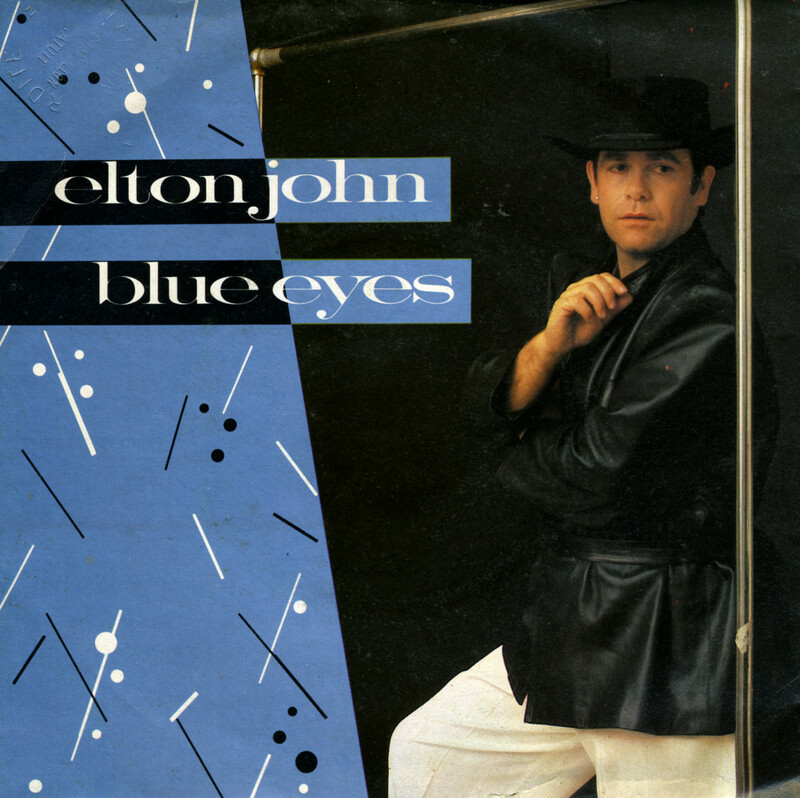 'Blue eyes' was written by Elton John and Gary Osborne and released by Elton John in 1982 as the first single from the album 'Jump up!'. The single reached number 8 in the UK singles chart and number 10 in the Dutch Top 40. At the time of its release, I wasn't particularly impressed with this song, but I've grown to like it almost three decades later. Perhaps I'm getting less critical of Eighties music than I was then. 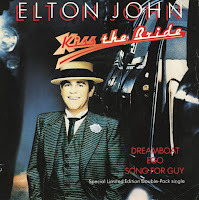 Elton John and Gary Osborne wrote this song, which was released in 1980 as a single from Elton John's album '21 at 33'. The song can be described as an uptempo ballad. 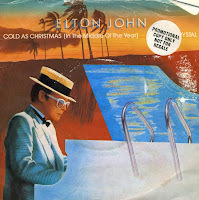 In the US, it would be Elton's highest-charting single co-written with Gary Osborne, while in the UK, where the song only reached number 33, 'Blue eyes' would eventually hold that honour. 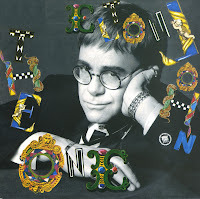 Despite its impressive performance in the US charts, Elton has rarely performed 'Little Jeannie' live, doing so only on his 1980 tour and during 2000's One Night Only concerts. 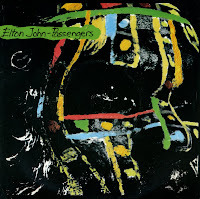 'Passengers' was released in 1984 as the second single from Elton John's album 'Breaking hearts'. It reached number 5 in the UK singles chart and number 9 in Australia. 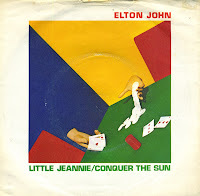 The song was written not only by Elton John and Bernie Taupin, who write most of John's material, but in collaboration with Davey Johnstone and Phineas McHize. The single reached number 10 in the UK singles chart, number 11 in the Dutch Top 40 and number 9 in the US Billboard Hot 100 chart. 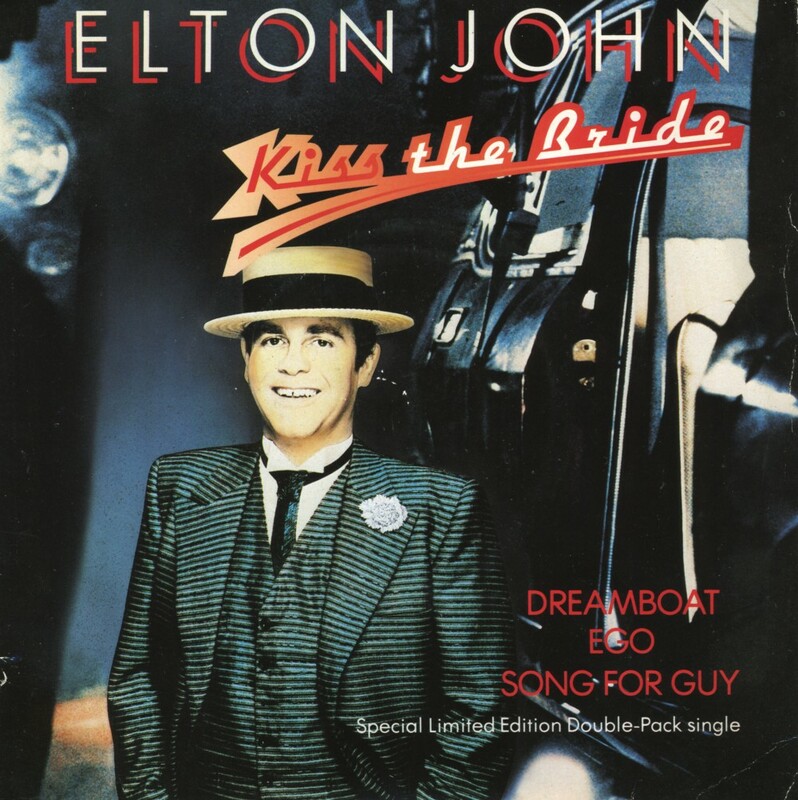 The third single from Elton John's 1983 album 'Too low for zero' was 'Kiss the bride'. 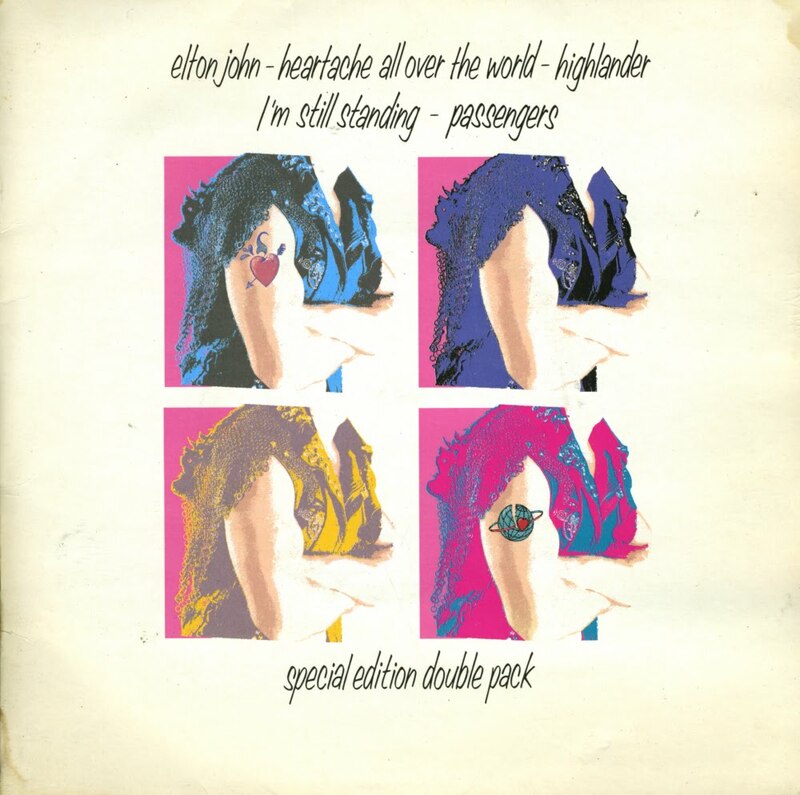 Released in this limited edition double pack, a second disc included the old classic 'Song for Guy' from 1978 and another single from the same year, 'Ego'. Curiously, this package was not housed in a gatefold sleeve; the two discs were crammed into one sleeve instead. 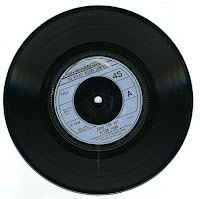 The single reached number 20 in the UK singles chart, with lower chart placings in Australia, Canada and the USA (number 25, 37 and 25 respectively). 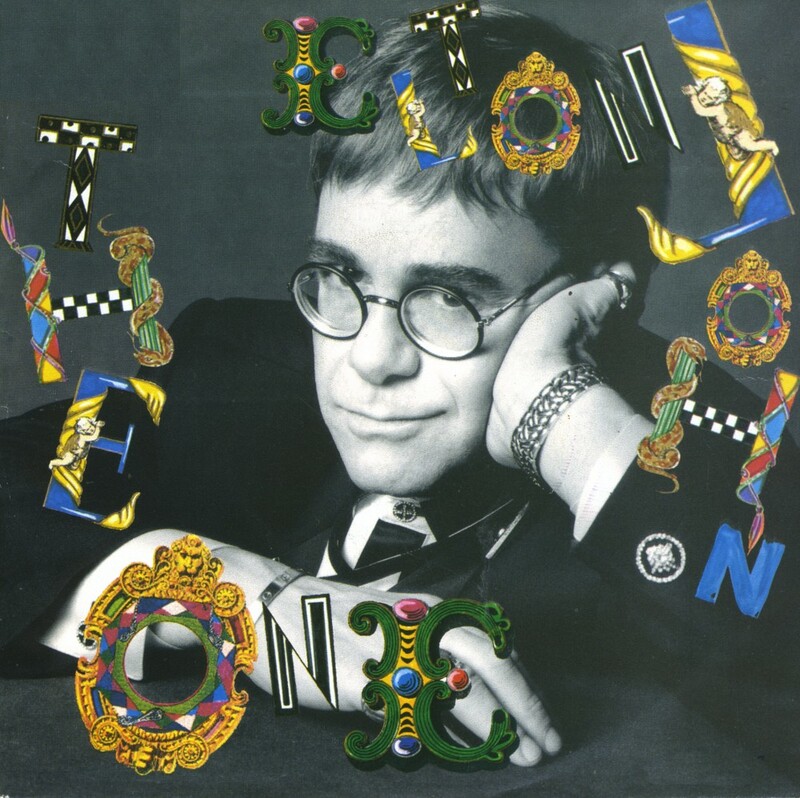 I hated the song 'Nikita' by Elton John. I thought it was a sentimental piece of drivel with a much too repetitive chorus. 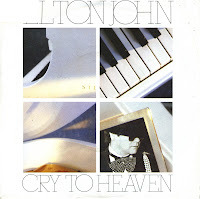 This made it hard to like 'Cry to heaven', released a few months later. Still, I did buy the single a few years later, realising that this song actually had an interesting melody. 'Cry to heaven' reached number 12 in the Dutch Top 40 and number 47 in the UK singles chart. It was less successful than 'Nikita', which inexplicably became a top 10 hit almost everywhere. 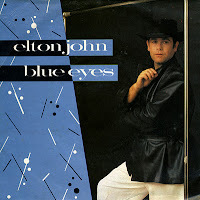 'I guess that's why they call it the blues' was released in 1983 as a single from Elton John's album 'Too low for zero'. The track features Stevie Wonder on harmonica and received favourable reviews from the moment it was released. It has gone on to be one of Elton John's most-played songs on radio stations from the Eighties portion of his career. The single reached number 5 in the UK singles chart and number 4 in the US Billboard Hot 100 chart, but failed to reach the Dutch Top 40. The single version of 'Song for Guy' is one and a half minutes shorter than the album version. 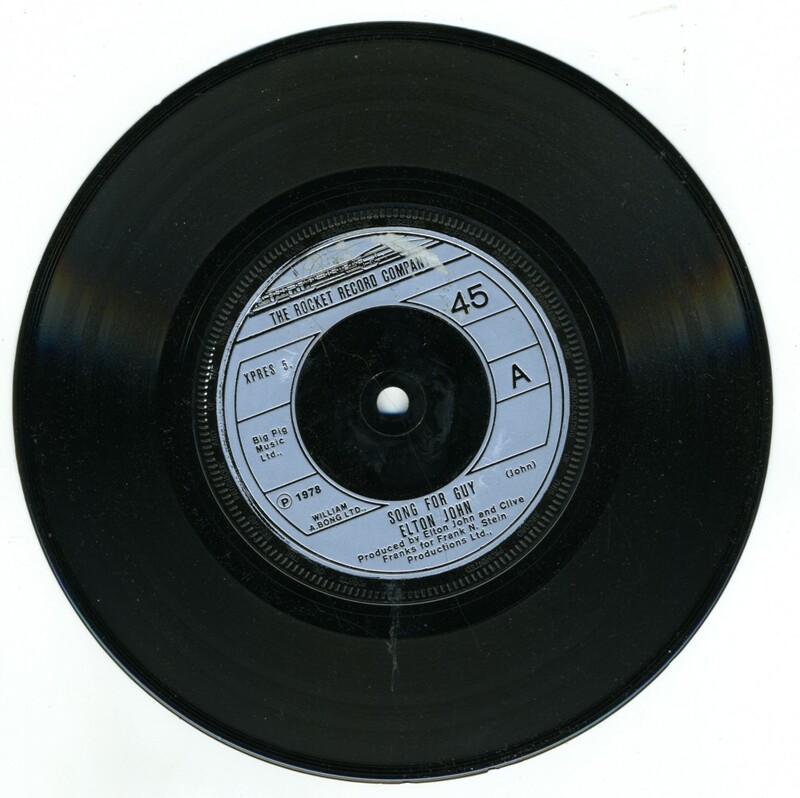 The single reached number 4 in the UK singles chart and number 6 in the Dutch Top 40. Yesterday it was twelve and a half years ago that Diana, Princess of Wales, affectionately known as Lady Di, was killed during a mysterious road accident in a tunnel in Paris. The outpouring of grief in the UK was unprecedented, but also set a trend that equalled mass hysteria whenever somebody famous died. Part of the funeral service was Elton John's performance of 'Candle in the wind', the lyric of which was rewritten to suit the circumstances of Diana's life and death. 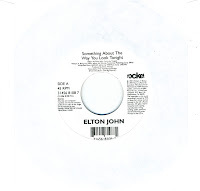 When the song was released as a single, the official A-side was the song 'Something about the way you look tonight', a track from his then-current album 'The big picture'. The single reached number 1 around the world. 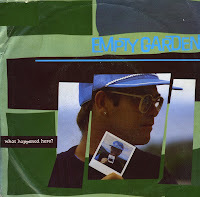 'Empty garden' was written by Elton John after his friend John Lennon was murdered by an obsessed fan in front of his New York City apartment on December 8, 1980. He first performed the song live at Madison Square Garden in 1982, with Lennon's widow Yoko Ono and their son Sean in the audience. 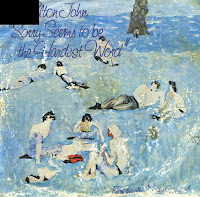 The 'Empty garden' referred to in the song is Madison Square Garden, where John Lennon did a duet with Elton in 1974 during his last stage performance. Elton has since performed the song several times at Madison Square Garden. The single was released in the summer of 1982, reaching number 13 in the US Billboard Hot 100 chart and number 51 in the UK singles chart. 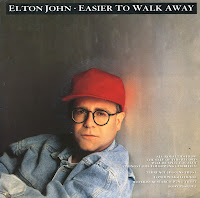 'I don't wanna go on with you like that' was taken from Elton John's 1988 album 'Reg strikes back'. 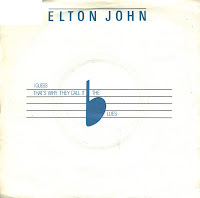 Written by Elton John and Bernie Taupin, the song describes the breakup of a lovers' relationship. When the single was released in the summer of 1988, it reached number 30 in the UK singles chart and number 2 in the US Billboard Hot 100 chart. It was kept from the top spot by the single 'Monkey' by George Michael. This single has the unique distinction to be the inspiration for two very recognisable women in music: Kate Bush and Tori Amos. Kate Bush recorded a cover of 'Rocket man' in 1994, whereas Tori Amos performed 'Tiny dancer' during her concert tour in the same year. 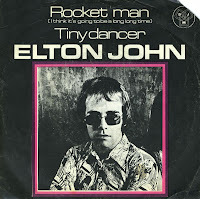 The song 'Rocket man' was conceived when Bernie Taupin saw a shooting star or a distant airplane. The lyric describes a Mars-bound astronaut's mixed feelings at leaving his family in order to do his job. The single reached number 2 in the UK singles chart and number 6 in the US Billboard Hot 100 chart in 1972. 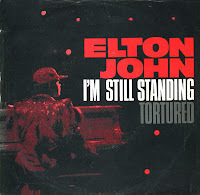 'I'm still standing' was taken from Elton John's 1983 album 'Too low for zero'. The lyric of the song is about making a comeback despite problems in daily life. It could well be autobiographical, although Elton John was consistently successful thoughout the Seventies and early Eighties. The single reached number 4 in the UK singles chart, number 12 in the US Billboard Hot 100 chart and number 8 in the Dutch Top 40. 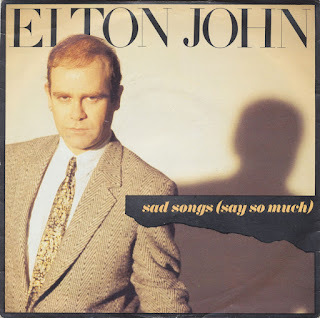 'Sorry seems to be the hardest word' was written by Elton John and Bernie Taupin. 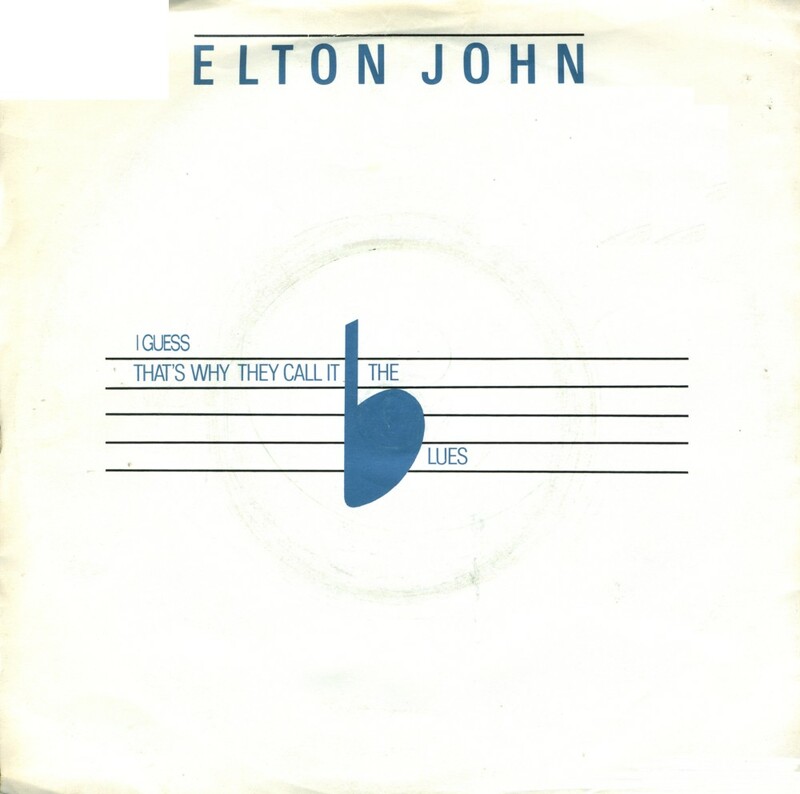 It was one of the rare instances where Elton John himself wrote much of the lyric. The track was released in 1976 as a track on his album 'Blue moves'. When it was released as a single, it reached number 11 in the UK singles chart, number 6 in the US Billboard Hot 100 chart and number 14 in the Dutch Top 40. In 2007, Marty Wilde released a cover version of this track on a compilation cd to commemorate his 50 years as a performing artist. It was a duet with his daughter Kim, a successful artist in her own right. Although their version is commendable, nothing beats the beauty of the original. 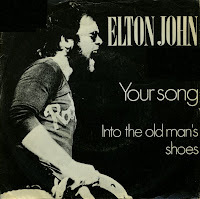 Released in January 1972, 'Your song' was Elton John's eighth single release, but his first hit. 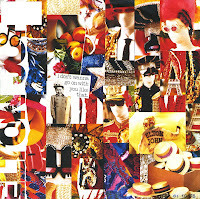 The song was written by Elton John and Bernie Taupin. The song was part of a stockpile of songs John and Taupin wrote in 1969 while they were living together. John pinpoints his composition of the music to October 27. Supposedly, it took him only ten minutes. Taupin had penned the lyrics earlier that day over breakfast. The single reached number 7 in the UK singles chart, number 8 in the US Billboard Hot 100 chart and number 10 in the Dutch Top 40.